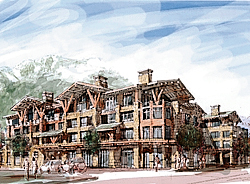 A development group has submitted to the city of Ketchum this artist?s rendering of the proposed Bald Mountain Lodge, as seen from Main and River streets. Applicant Bald Mountain LLC has issued to the city a pre-application design for the four-story, four-star hotel. The city is still reviewing new zoning and building guidelines. Pending the project?s approval, construction could begin in May, with an opening set for late fall 2008.